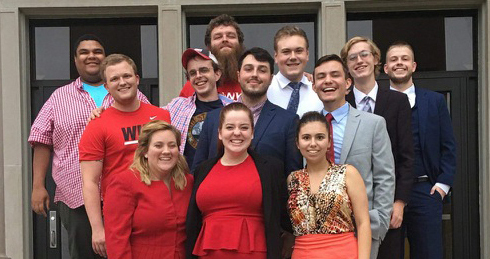 The WKU Forensics Team’s eight debaters placed second in overall debate team sweepstakes at two tournaments hosted by the University of Central Missouri in Warrensburg, Missouri, the weekend of Oct. 20-21. On Friday (Oct. 26), the team will host a free public showcase in WKU’s Faculty House at 6:30 p.m. The team will next travel in three weeks to McKendree University in Lebanon, Illinois. Anthony Survance, a junior from Louisville, tournament champion in Lincoln-Douglas debate at the Dale Carnegie tournament; quarterfinalist in Lincoln-Douglas debate and fifth L-D debate speaker at the Missouri Mule tournament. Alex Rivera, a junior from Newton, Kansas, top L-D debate speaker and quarterfinalist in Lincoln-Douglas debate at the Dale Carnegie tournament; fourth L-D debate speaker and octofinalist in Lincoln-Douglas debate at the Missouri Mule tournament. Ben Hanson, a freshman from Louisville, top L-D debate speaker and quarterfinalist in Lincoln-Douglas debate at the Missouri Mule tournament. Madelynn Einhorn, a freshman from Oakwood, Ohio, semifinalist in Lincoln-Douglas debate at the Dale Carnegie tournament; octofinalist in Lincoln-Douglas debate at the Missouri Mule tournament. Isaac Keller, a sophomore from Kansas City, Missouri, fourth L-D debate speaker and quarterfinalist in Lincoln-Douglas debate at the Dale Carnegie tournament. Brian Anderson, a senior from Hodgenville, fifth L-D debate speaker and octofinalist in Lincoln-Douglas debate at the Dale Carnegie tournament. Kelly Stone, a senior from Louisburg, Kansas, octofinalist in Lincoln-Douglas debate at the Missouri Mule tournament; octofinalist in Lincoln-Douglas debate at the Dale Carnegie tournament.